Singles action will exclusively feature on Day Three of the Seamaster 2017 ITTF World Tour Platinum, Hybiome Austrian Open being held in Linz so here is a quick look at what is coming your way on Saturday 23rd September. Latin America and Europe will do battle in the quarter-finals of the Men’s Singles tournament as Hugo Calderano faces Simon Gauzy with a spot in the penultimate round being awarded to the victor. Brazilian competitor Hugo Calderano, who is seeded 15th in Linz, will be hoping to come out on top against fellow club teammate Simon Gauzy but with the Frenchman occupying the no.4 spot on the seeding list surely the odds are in the latter player’s favour? The other fixture in the lower half of the quarter-finals draw sees the second seed Koki Niwa meet qualifier Lin Gaoyuan. Koki Niwa and Lin Gaoyuan were both pushed all the way to the deciding game in the previous stage of the event, but will the full match distance be required to decide a winner between the Japanese and Chinese representatives in their last eight tie? Egypt’s Omar Assar will look to extend his fantastic run in the Men’s Singles category when he takes on China’s Yan An in the upper half of the draw, while the no.3 seed Fang Bo and the sixth seed Kenta Matsudaira prepare to meet in what is anticipated to be a thrilling encounter to watch. The Women’s Singles tournament will also be whittled down to two players by the end of Day Three, with quarter-finals and semi-finals action scheduled to take place. There is a rather intriguing fixture in the last eight as two players, who began their campaigns in the two-day qualification tournament which preceded the Seamaster 2017 Austrian Open, compete against each other for a place in the penultimate round of the main draw. Zhang Rui and Gu Ruochen are the two aforementioned qualifiers who will go head-to-head in the quarter-finals, while the third qualifier involved in the last eight Gu Yuting meets the no.10 seed Hina Hayata. Hong Kong is still in the hunt for a podium finish but first Doo Hoi Kem faces the difficult task of overcoming China’s teenage ace player Sun Yingsha. 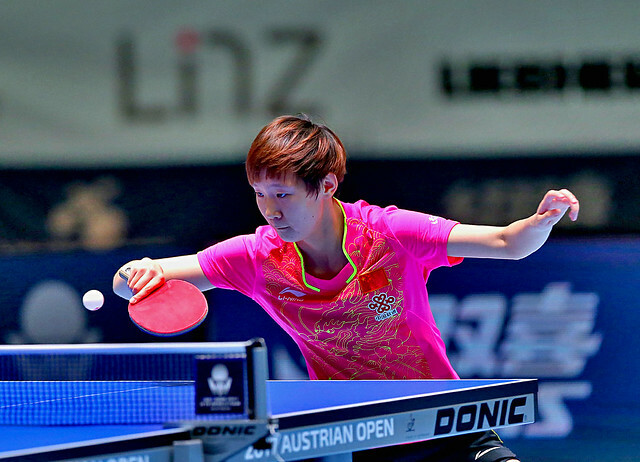 The top seed Chen Meng and the no.6 seed Wang Manyu will contest the other match in the quarter-finals.